The Admit Card will shortly be released, till then keep visiting this page to know latest news on it! Though you had opted for the ‘Exam Centre’ while the registration as per your convenience, however, the Bank still has the right to allot you the another exam venue than the chosen one. And, no request in this regard will be entertained. Another thing to note is that you have to take all expenses when you go for your Online Test. There is no facility on the behalf of the Bank. Another job opportunity has been given to the attentive applicants. And, they must not fail to avail it. Whether you are OBC, SC, ST, General, PWD, OC, VI, HI, etc., or other, access to the Online Test Call Letter is only provided to those who have their unique credentials. Do not bring other than what is required. Putting different, we can say you have to come with your Admit Card and other photo identity documents. Also, be a regular visitor at this blog and at www.syndicatebank.in, too. Talking about the overall post division, we have Manager (Law), Manager (Security), Manager Credit (CA), Technical Officer (Electrical), Technical Officer (Civil). Considering all, the maximum number of posts goes to Manager (Security). Discussing the Grade/Scale, we have MMGS-II (Full Form is Junior Management Grade / Scale) and JMGS-I (Full Form is Middle Management Grade / Scale). Whichever post you seemed to have the interest in, without Syndicate Bank Specialist Officer Call Letter 2017, Bank will not let you step into the Exam Centre (Address and Codes are given in the Admit Card). If you cannot log on to the official website address, this could happen because of too much traffic on the server. Thus, we suggest you download your Manager Call Letter for Online Test as soon as they are out. 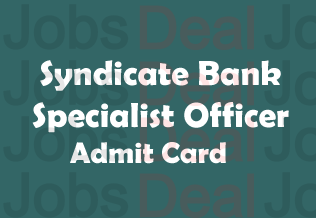 We have told you above that Syndicate Bank, for this recruitment, will organise Online Test, GD/ Interview. This is to inform that for some posts, selection rounds are different. What is clear is that only those who clear Online Test will be called for Group Discussion/Interview. A mini guide on ‘Exam Pattern’ is being given beneath. Consider checking it. Hope you have had enough knowledge of collecting your Technical Officer E-Admit Card or Call Letter with an intention to take part in the Online Test, let’s talk about the exam pattern below. The total questions that will be asked in Online Test are 200. Each question carries single mark. In other words, total marks that the Online Test will carry are 200. Time duration of Online Exam will be 2 Hours (1:20 Minutes). Questions will come from English Language, Professional Knowledge relevant to the post, Quantitative Aptitude, and Reasoning. Exam Preparation is a must-do thing for all applicants. But don’t take Syndicate Bank Manager/ Technical Officer Call Letter 2017 lightly because your entry to exam venues depends on it. At first, you will need to look up the main website of the bank that is considered as www.syndicatebank.in. After visiting it, go to the careers link and click on it. Then, you have to choose the option for current recruitments. Click on the link which is about “Specialist Officer” and find the “Online Test Call Letter” link there. Give all details as asked and submit them all. After a couple of seconds, you will be able to grab your Online Test Call Letter. If you still have any question on Syndicate Bank SO Admit Card 2017, feel free to submit your views on it here. Don’t forget to subscribe to us! What is the exam date of jmgs-1 posts? Currently, there is no updated regarding Syndicate Bank Exam Date. As soon as the " jmgs-1 Exam Date" is out, we will tell you.